This Report presents the main findings of the second year of the RCA longitudinal study which was carried out between January- February 2017. The second year study builds on the insights gathered in the first year and seeks to support Sudokkho in continuously improving and adapting the design and implementation of the programme through enriching the understanding of the perspectives, motivations and experiences of young people concerning employment and work-related training. The study is commissioned by Palladium in collaboration with the British Council and Swiss Contact, and is funded by the Department of International Development (UK Aid). ​Our researchers observed and Year 1 trainees shared there have been big changes in their lives and communities over the last year. Of the eight Year 1 trainees, only three were working in the same industry for which they had been trained. Two of the trainees had recently had babies and another was expecting a baby soon. For another trainee her mother in law passed away. One former mason trainee has now found a regular job under a contractor and friends said ‘he has now become a big man and has money’. Two of the former sewing machine operator trainees are still studying for their diplomas in textiles and whereas one wanted a job in a textile factory after finishing his diploma, the other is working as a security guard at the airport. Many young men and women across the study locations shared that they primarily work to earn money to pay for the increasing daily demands for cash, such as to pay rent, utilities, food, mobile credit and recreational costs. Young men and women shared the criteria they look for in their desired jobs; shorter working hours (particularly for garment workers), less harassment, status and respect, better pay, guarantee of regular income and the freedom and flexibility to work when they wish. As we saw in Year 1, young men and women explained that the conditions are improving in the garment factories with better wages, more regular payments and a better working environment. As we saw in Year 1, many youths shared that they had ‘fallen into’ the training either as a result of sug- gestions or pressure from their families to acquire skills for further employment. This Reality Check Approach (RCA) Study was carried out between February – April 2016. 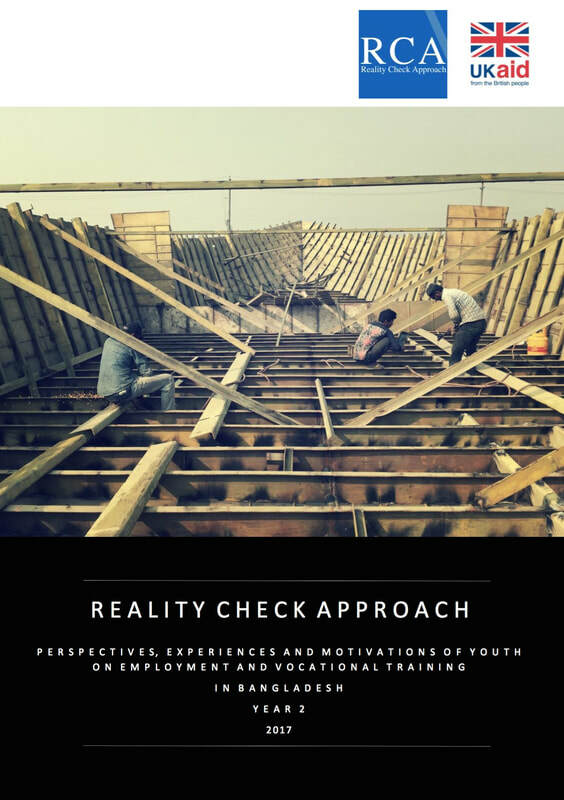 The study is intended to provide insights to better understand the perspectives, motivations and experiences of youth in relation to employment and work related training. The study is commissioned by Palladium in col­laboration with the British Council and Swiss­contact, and is funded by the Department of International Development (UK Aid). Many young men and women shared dreams of having a permanent ‘proper job’ which would bring security and respect. They typically wished for government jobs, working for private companies. Young men told us they dreamt of jobs in the army, police and fire service and young women dreamnt of being a nurse, teacher or other government jobs. However these ‘opportunities’ require academic qualifications. Young men and women who had just left school, saw this period (15-25 years old) as generally less about starting a career but rather earning respect and money. Respect could be gained through ‘contributing to the family’ and this also endows opportunities to influence family decision making. Young men and women shared that what type of job they could seek is often determined by their network and money, and not any skills training. People explained the hours are long (12 hour days), there is ‘a lot of pressure on the head and body’, strict regulations that serve to benefit only the owner and also incidences of verbal and sexual harassment. 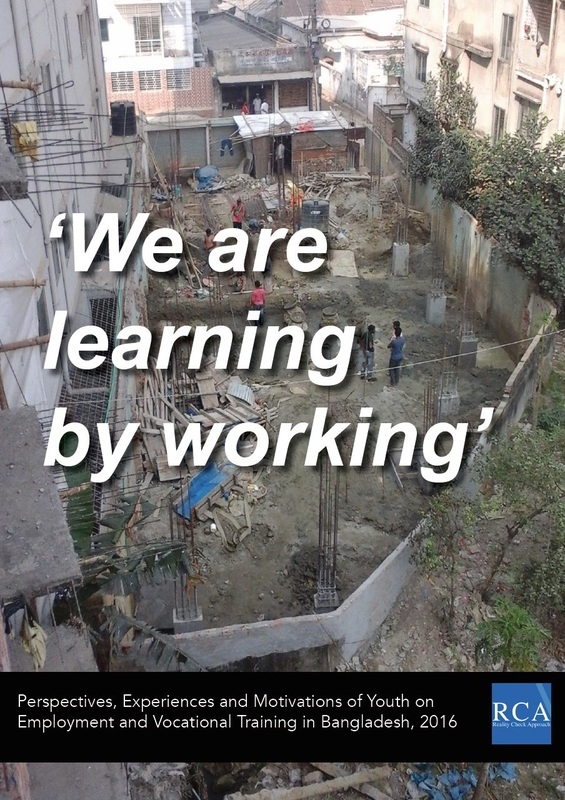 In the construction industry, many helpers described the work as ‘in-humane’ and they did not want their children to have to do this type of work. Many shared stories of injuries and accidents on the site and poor safety and security provisions. The over-riding preference people shared is to ‘learn by doing’. This was true not just in terms of people’s preference for practical classes over theoretical training, but also in related to their preference for informal on the job experience rather than formal training. 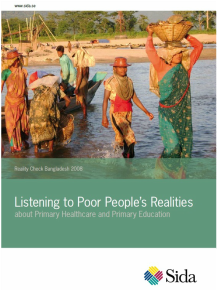 This 5 year Reality Check undertaken by GRM International on behalf of the Swedish Embassy in Dhaka primary aim, was to provide information about how development aid support for the Health and Education Sectors in Bangladesh was actually being understood and experienced by poor people. The Swedish Country Strategy for Bangladesh includes a framework, called Bangla-Applied Perspectives and Principles in Action (APPA), that is based on Sida’s two perspectives and its four principles of Participation, Non-discrimination, Transparency and Accountability. The Bangla-APPA framework details an approach to ensure dialogue from above (development partners, Government of Bangladesh), from within (the sector programs) and from below (NGOs and poor men and women). The Reality Check Approach constituted an important contribution to the ‘from below’ approach. Over the course of 5 years the RCA revealed a number of relevant perspectives and observations in relation to: school dropouts, teacher training, terminal exams use, quality of health facilities, public health, increasing salt intake and the use of traditional birth attendants. School dropout issues: conventional wisdom in Bangladesh had been that poverty was a key barrier to school attendance and those parents would be a primary barrier for children gaining an education. The RCA uncovered that in many cases the issue was far more nuanced. School dropout was often caused by a lack of motivation on the part of the students: particularly amongst boys who often could not see a benefit from attending school. Over the course of the 5 years issues surrounding the quality of education and lack of confidence amongst boys particularly, where due to ‘holding back’ they were far older than their peers, became far more significant to defining educational choices than poverty as a stand along issue. Teacher training: The RCA revealed widespread systemic problems associated with the roll out of the compulsory certificate in education required for all Bangladeshi primary school teachers. The training was perceived to be too long and theoretical and had caused significant temporary staff shortages. Terminal exam: The introduction of a new standardized terminal exam provided a transparent test for primary school leavers. Initially students and teachers agreed that this was a positive step as it made both parties ‘more serious’ about achievement. However as time went on it was felt that this examination; provided an overly quantified narrower basis for assessing achievement; memorization was increasingly becoming the normalized form of learning and there was clear evidence of boredom amongst children in relation to this. Quality of Health Facilities: People appeared to prefer local private health providers to formal Government health facilities; because whilst nominally free, the public institutions carried hidden costs, had more limited opening hours, were inadequately resourced and offered less pleasant experiences for users. Public health and increasing salt intake: The RCAs findings explored the false presumption and resultant gap in funding associated with the idea that non-communicable diseases such as high blood pressure and diabetes primarily affect ‘better-off’ people. The RCA also revealed the very high intake of salt amongst individuals living within the study households and that this unhealthy habit was exacerbated in times of high inflation or food insecurity.Traditional birth attendants: From the first year of the study, individuals emphasized their positive experience of using Traditional Birth Attendants (TBAs). This went counter to policy initiatives of the period which were attempting to sideline the TBAs in favor of more formally trained skilled birth attendants (SBAs). The SBAs were generally perceived to be less entrenched in communities and considered to be overly focused on commercial gain rather than the social welfare of their users.